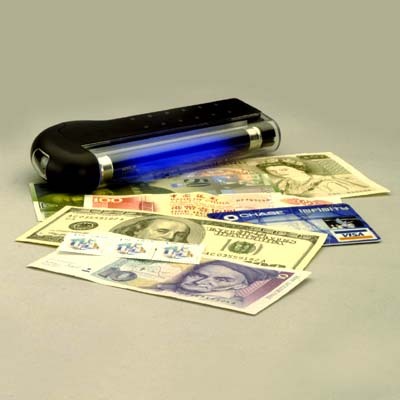 The device with built-in ultra-violet tube which decodes "invisible "security marks(fluorescent marks) on banknotes or stamps. With counterfeit bill, the UV light is diffused on the paper and reflects evenly towards the eyes.It also with built-in torch bulb served for searching purpose , etc. Application	: Portable design - ideal for banks,hotels,shops,restaurants,tourists and wherever money is changed. Packing: Each piece in gift box; 24pcs./inner carton; 120pcs./export carton. Meas: 41x24x81cm (0.08CBM). GW: 21KG.